Wednesday, <?xml:namespace prefix = st1 ns = "urn:schemas-microsoft-com:office:smarttags" />April 15, 2009. It was 1983, I was 17, the radio station was the black-owned WBLS and the voice belonged to Joseph Simmons a.k.a. Run. When Run and his partner “DMC in the place to be” who went to “St. John University” dropped their two-sided 12-inch “It’s Like That/ Sucker M.C.’s” in March of 1983 they were the “new-school” of hip-hop. They jettisoned the stylistic excesses of Grand Master Flash and the Furious Five, Afrika Bambatta and the Soul Sonic Force and their artistic god-father Kurtis Blow and replaced them with the streamlined black fedora, colored Lee jeans, dukey gold-chains and unlaced shell-top Adidas that became their signature look for a decade. For many folks, Run-DMC didn’t become a relevant pop act until they made their move to MTV, first with the video for “King of Rock” (1985) and then their crossover, star-making collaboration with Aerosmith on a remake of “Walk This Way.” It was in the brilliant video for “King of Rock” that the trio of Run, DMC, and hip-hop’s most visible DJ ever, Jam Master Jay, mocked the conservative undertones of Rock and Roll tradition, taking shots at Elvis (yes, please a little less conversation), Michael Jackson (who later sought them out to help validate him in the ‘hood) and The Beatles (though Chuck D would one up them on “Fight the Power” and Little Richard is still carrying the blood stained banner). Seventeen years after the release of “King of Rock” it is an accepted fact the group will become the first hip-hop act indicted in the Rock Hall, when they are eligible for induction in 2008. “King of Rock” helped Run-DMC transcend the ‘hood (truth be told the group’s hometown of Hollis, Queens was at worst lower middle-class) for the same reason Marley crossed over the decade before: the guitars, in this case courtesy of Eddie Martinez. At the behest of Rick Rubin, then the partner of Run’s brotha and current “race man” Russell, the group began to incorporate guitar riffs the year before (also courtesy of Martinez) on “Rock Box” which was the lead single from their first full-length disc Run-DMC (1984). In a world where most of the dominant hip-hop artists, like Kurtis Blow ("these are the breaks") and even Melle Mel still flowed mellifluously to upbeat party grooves, Run-DMC was “hard-core,” influencing contemporaries like Schoolly D and Just-Ice and first generation “new school” acts including Boogie Down Productions (KRS-One and Scott La Rock). The collaboration with Aerosmith on “Walk This Way” (which—along with the drug counseling—helped resurrect Aerosmith’s career) was really a no-brainer. The song had long been part of the hip-hop DJ canon, back when hip-hop was still plugged into lampposts in the hood (on the street the song was referred to as “Toys in the Attic” in reference to the 1975 album that the original version appeared on), but it was also the culmination of a concerted effort by the group’s management Rush Productions (or “Race Man, Inc.") to cross the group (and hip-hop) over to mainstream audiences with their featured roles in the fictional Russell Simmons biopic Krush Groove, their historic appearance at Live Aid (Run-DMC was among the few black acts at the concert which also featured Sade and the Teddy Pendergrass’s first post-accident stage appearance alongside Ashford and Simpson) and “Christmas in Hollis” (which samples Clarence Carter’s classic “Back Door Santa"), their contribution to the very first Very Special Christmas. With the success of Run-DMC’s third full-length disc Raising Hell (1986) and singles like “Walk This Way,” “It’s Tricky” (which slurred the buzz riff from The Knack’s “My Sharona"), and the damn-near insipid “You Be Illin’,” the group became a white frat-boy favorite and laid the early foundations of hip-hop’s mass appeal and Russell Simmons’s burgeoning urban style empire. Most folks forget that “Walk This Way” wasn’t the first single from Raising Hell but rather the two-sided classic “My Adidas/Peter Piper” which the group recorded, no doubt, in response to already circulating charges that the group had sold out. “Peter Piper”—which samples the legendary “breaking bells” break (courtesy of Bob James “Take Me to the Mardis Gras)—took the group back to their (and hip-hop’s) humble beginnings at a time when hip-hop was all too concerned about being watered-down for mainstream consumption, a fact that was later realized with the success of (MC) Hammer and DJ Jazzy Jeff & the Fresh Prince (who’s that?). “My Adidas” also responded to those “sell out” charges by celebrating quintessential mid-’80s B-boy style and cementing hip-hop’s relationship with the fashion industry by offering up the menacing black male bodies that hip-hop had largely been associated with as living mannequins for everybody from Bally (see Slick Rick’s “Ladi Dadi"), Gucci (Schoolly D: “looking at my Gucci it’s about that time") and of course Tommy Hilnigger (I mean Hilfiger). Run-DMC was so cognizant of how they were perceived in the ‘hood that they circulated the live “Here We Go” ("DMC and DJ Run, dum, diddy dum, diddy dum, dum, dum") to black radio in early 1985 to remind folks that they were hip-hop hard-core personified (I didn’t realize at the time that they were referencing the children’s classic Hands, Fingers, Thumbs until I read the book to my two-year-old daughter 15 years later). By 1988, the first generation of the “new school” was firmly entrench as the genre was dominated by PE, KRS-One, Eric B and Rakim, NWA, LL Cool J (who had to answer to the ghetto hard-core himself after Walking Like a Panther) and upstarts like Big Daddy Kane, De La Soul and EPMD. 1988 also marked the beginning of hip-hop’s tenuous dance with black radio and R&B with folks like Rakim recording cameos for the likes of Jody Watley ("Friends") and the emergence of Teddy Riley’s signature New Jack Swing sound, which incorporated soft-core hip-hop rhythms with old-school Soul harmonies and created the first generation of hip-hop/R&B hybrids like Keith Sweat, Bobby Brown, Heavy D and the Boys, Guy and later Blackstreet (while killing the careers of Kane and Kool Moe Dee who inexplicably thought is was in their best interests to have Riley produce tracks for them). Though the Kings of Rock had moderate commercial success with the god-awful “Mary, Mary” (from Tougher Than Leather) their follow-up recording, Back From Hell (1990) (which included “The Ave.” the group’s first attempt at “social commentary” since Raising Hell‘s “Proud to be Black” and the early classics “It’s Like That” and “Hard Times") met with indifference, though it was arguably their strongest material since King of Rock. It’s all luv when CL concludes with the line “look ma, no shoe laces,” speaking for a whole generation of young black boys who rocked untied shell-top Adidas. Originally Published at PopMatters.com (2002). 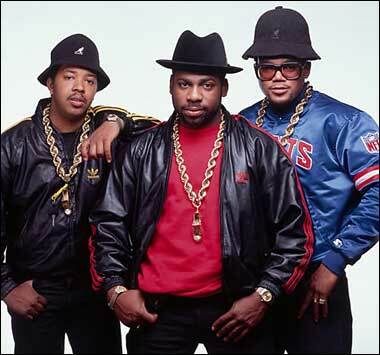 Note that Run-DMC was not the first group to be inducted to the Rock Hall. The Hall did the right thing and made Grandmaster Flash and the Furious Five the first rap act inducted.